Clean Water is working in collaboration with the NJ Environmental Justice Alliance and Ironbound Community Corporation in the South, West and East Wards of the City of Newark to create a Resiliency Action Plan (RAP). This partnership will work in conjunction with the City of Newark, community leaders, and residents to address efforts to reduce the greenhouse gases that contribute to climate change, adapt to the changes already underway, and foster social inclusion and cohesion. This project was made possible with the support of the Kresge Foundation. The Kresge Foundation selected seventeen community-based nonprofits from across the nation, out of over 230 nonprofit applications, with the grant. As the only application selected in New Jersey, Ironbound Community Corporation, New Jersey Environmental Justice Alliance, and Clean Water Action, have been awarded this opportunity in Newark to work as a collaborative team to deepen their leadership in local and regional climate resilience efforts and create a Newark Resiliency Action Plan (Newark RAP). This partnership will work in conjunction with the City of Newark, community leaders, and residents to address efforts to reduce the greenhouse gases that contribute to climate change, adapt to the changes already underway, and foster social inclusion and cohesion. 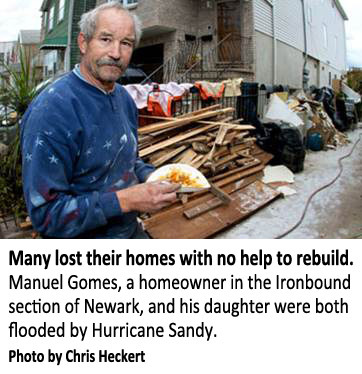 As a frontline community, Newark has seen first-hand the impact of climate change, with Hurricane Sandy being the most recent, and most severe, impact. With resident's public health and safety in mind, it is now the time more than ever for Newark to lead the way in climate resiliency efforts. The risk to our residents' public health and safety make this a critical opportunity for Newark to seize and for our communities to lead the way towards greater climate-resiliency. No one could have predicted the extent and cost of the devastation. Homes full of sewage and toxics from nearby chemical plants, family memories and life savings lost forever. One of the East Coast’s largest sewer plants and trash incinerators were inoperable for many weeks. Port Newark and Elizabeth, 2nd largest in the nation, was shut down for a week with 10,000 dealer-ready cars destroyed. Few resources came to help cities like Newark in Sandy’s aftermath and some of our New Jersey neighborhoods many never fully recover. What if every street had “curbside greenways” so that rainwater would be captured in troughs, just below the street? This rain water could be used to feed roadside trees and greenery instead of running off the curb into the street and waterways, carrying with it oil drippings and other debris. What if buildings had “green roofs”, planted with vegetation to capture rainwater, reduce ground level flooding, clean the air, reduce building temperatures and create relaxing spaces to enjoy? What if new homes and local business districts adhered to redevelopment approaches that required the installation of renewable forms of energy, energy conservation and efficiency measures, and what if financial assistance was available to make that happen? Our future is not about rebuilding what we had before. It is about doing it differently-more sustainably, more equitably and with the community helping to make the decisions. Support energy efficiency, conservation, wind, solar and renewable energy. Advance Zero Waste (reduce, reuse, recycle, compost). Reduce urban heat island effect and air pollution. Create and maintain rain, food, and roof gardens, as well as onsite composting. Install pollution & heat resistant landscapes, streetscapes, trees, parks, greenways and stream buffers. Establish onsite wastewater treatment, rainwater harvesting systems and safe reuse. Generate family supporting green jobs & business opportunities for local people. Direct city and private investment to green infrastructure and neighborhood designs. Help develop community-driven plans and implementation strategies that meet the needs of Newark residents. Join us as we build a Newark Resiliency Action Plan (RAP) to improve urban climate change resiliency and mitigation while advancing green jobs and a more vibrant, sustainable economy. Clean Water Fund has worked with diverse constituencies in Newark for over 14 years developing environmental justice leadership amongst its youth and in City Hall, as well as concrete, sustainable solutions that result in more vibrant and healthier neighborhoods. Clean Water Fund works side-by-side with Clean Water Action on programs for environmental justice, prevention of health threatening pollution, clean water, and creation of environmentally safe jobs and businesses. Clean Water Action's nonpartisan campaigns empower people to make democracy work. To get involved, contact us at njcwa@cleanwater.org.